Pit bull terriers have been in this country and a popular pet since before the Civil War. Although they are among the most intelligent and popular dogs in America today, pit bull terriers were even more popular in the early 1900s when they were the closest thing the United States had to a national dog. They were featured on U.S. recruiting posters in World Wars I and II, prominently featured as corporate mascots and cast as the ideal family dog in television and movies. One of the earliest and most famous pit bull terriers was Sgt. 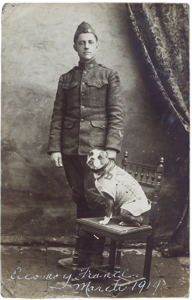 Stubby, a war dog in World War I. Sgt. Stubby learned bugle calls, drills, and even a modified dog salute. He saved his regiment from a mustard gas attack; located wounded men, barking until paramedics arrived; and served in 17 battles in the trenches in France. He earned the rank of sergeant for capturing an enemy spy. When he returned home to America, he got a hero’s welcome, marching in parades across the country, and when he died in 1926, his obituary in The New York Times was half a page long. Bonzo the dog, a cartoon character created by George Studdy that closely resembled a pit bull terrier-type dog quickly rose to popularity in the 1920s. He starred in one of the world’s first cartoons, became an inspiration for mass-marketed merchandise, and was a favorite among both children and adults. Ironically, much like the situation with pit bull terrier-type dogs today, there was much debate over what type of dog Bonzo really was. Studdy would never say. A well-known dog breeder, Major J.E. Power, even attempted to producing a new breed of terrier inspired by Bonzo to be named the Bonzo Terrier, but his attempts were a failure. Buster Brown, a comic strip character created in 1902, had a pit bull terrier-type named Tige. 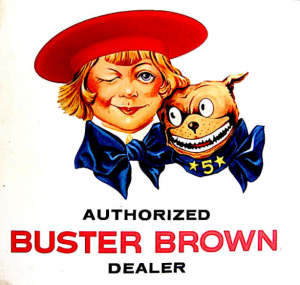 Brown and his dog went on to become mascots of the highly popular Buster Brown Shoe Company from 1904 through the 1950s. The company sent actors, each accompanied by a dog, to perform in department stores, theaters and shoe stores from 1904 until 1930, and both characters were prominently featured in the company’s advertising. There are many other examples that illustrate the widespread popularity of these affable dogs. Pit bull terriers even have the distinction of being the only dog featured on the cover of Life magazine three times – more than any other dog. One of the reasons there are so many pit bull terriers in shelters today is because pit bull terriers are still extremely popular pets! In fact, according to Vetstreet.com, the American pit bull terrier is one of the top three favorite “breeds” in 28 states. Over the years, pit bull terrier–like dogs have been loving pets to everyone from presidents and authors to singers and film stars. Famous people who have loved and had pit bull terriers include: Thomas Edison, John Steinbeck, Billie Holiday, President Teddy Roosevelt, Helen Keller, President Woodrow Wilson, General George Patton, Humphrey Bogart, Dr. Seuss, Fred Astaire and many more. In recent years, famous pit bull devotees include Jon Stewart, Ira Glass, Brad Pitt, Orlando Bloom, Cesar Milan, Rachael Ray, Serena Williams, Jennifer Aniston, Miranda Lambert, Betty White, and many more. I personally own 2 pit bull terriers and they are as gentle as any other dog that I know. It really is a shame that people perpetuate old myths about these wonderful animals.